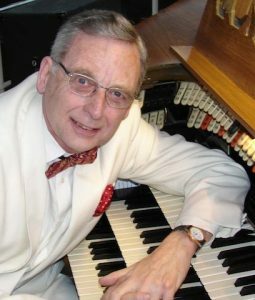 With a family name that is synonymous with the very heart of the organ scene in the UK, Len Rawle has the benefit of a family steeped in the tradition of theatre organ preservation. More than 40 theatre organs have passed through the Rawles’ ‘saving’ hands’! He maintains the Wurlitzers at Kilburn and Woking and headed up a £40,000 project which raised the long-entombed Granada Tooting Wurlitzer in South London. Born in Tonypandy, South Wales in 1938, Len’s classical training, starting at age 4, came from the London College of Music in Cardiff. Later his studies transferred to London where he also came into contact with many leading organists. He was also fortunate in having the UK’s first residence Wurlitzer from the Granada Wandsworth Road, London in the family home. Eventually he purchased the famous 4 manual Wurlitzer of the Empire Theatre, Leicester Square, which became the centrepiece of his own, self-built home at Chorleywood. Described by many, as the finest sounding residence Wurlitzer in the World, he has recorded, broadcast and televised this Wurlitzer many times. Two particular highlights were appearing on the very first ‘The Organist Entertains’ Programme (plus many subsequent ones) and also in the much celebrated and often repeated Sir John Betjamin BBC T.V. documentary ‘Metroland’. Len has given numerous concerts and ‘workshop sessions’ in the USA, Australia and Europe. One rather special educational programme for children in Buffalo, USA saw no fewer than 69 busloads arrive at the Spectacular Shea’s Theatre. ‘Len’s Finest Hour’ comprised initiating more than 2,500 youngsters, all of whom were absorbed in a one of a kind presentation that introduced 10-15 year olds to the organ for the first time. Len is one of those specialist artists who have never sought an engagement, being in the happy position of being kept busier than most, accepting invitations to appear around the world.